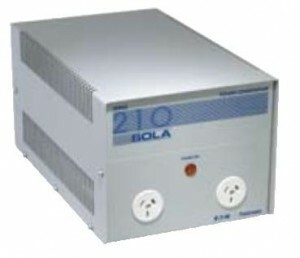 Designed in Australia, the 210 Series portable power conditioner provides smooth step-less control of output voltage to your computer or electronic system, whilst attenuating harmful impulses, surges and other power line disturbances. Models available from 500VA to 2500VA. The 210 Series incorporates improved surge withstand capabilities, as specified by ANSI/IEEE C62.41-1980 and is covered by the SECV Certificate of Suitability Number CS84292V.